A good coach can teach lifelong lessons to youth athletes. A golf coach is much more than just a teacher. A coach is someone who can analyze your motivation and help you use it when you play the game, as well as teaching the skills you need to make yourself a better golfer. You do not need to be a certified professional to be a coach, but you do need experience in playing and teaching the game. The first step to becoming a reputable golf coach is to learn every aspect of how to play the game. As a coach you will be asked to work with people of every skill level and temperament, so it is critical that you understand all the details of the game as well as being an expert in the basics. 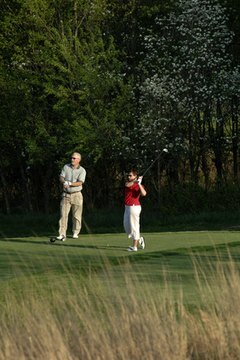 You do not need to be a certified teaching professional to be a golf coach, but it will definitely help. The drills and exercises you will learn on your way to becoming a coach will help you teach the game to others. The next step to being a good golf coach is tournament experience. Get involved in every tournament you can, and keep track of where you placed in each tournament so that you can include it on your coaching resume. A good coach knows how to play the game in any surrounding, and it is critical for a coach to learn how to approach a new course and develop a preparation routine that helps them win. Tournaments are how golfers gauge success, and if you want to develop a reputation as a desirable golf coach you must be able to show people that you know how to win. A good coach in any sport takes the time to understand people and how to help people in a variety of situations. It may help to take courses in psychology to gain a better understanding of how the human mind works, and it definitely helps to put yourself in contact with a variety of different kinds of people. You will need to learn patience with students, and to do that you need to experience what it is like to have students from all walks of life. Take time in tournaments to talk with everyone you can, and learn how different people approach the game so that you can pass that info on to your students. The best golf coaches are the ones who know how to deal with a situation based on a real-life experience.